Update: you can now use our SEO Calculator to price your SEO site audit, and then come back to Credo to find someone to work with! You’re probably in need of, or think you are in need of, an SEO expert. Lucky for you, you’ve arrived at the right place. Over the last few years I’ve helped over 300 businesses find and hire the right SEO expert consultant or agency for their business. And now I’m sharing the learnings with you. Hiring a great SEO starts with understanding it yourself. Just like owning a business, if something goes wrong because you did not educate yourself then that’s completely on you.If you think you need to hire an SEO expert, learn some SEO yourself first. Read the Beginners Guide to SEO, learn about links and why they matter (and the difference between a good link and a bad one), why content matters for SEO, and maybe even sign up to something like DistilledU to take a crash course in a structured format. After you understand the basics of SEO, then discuss your project with some people. Every business’s needs are different, so don’t be fooled into thinking that SEO is a one-size-fits-all sort of endeavour. As said above, SEO is not a one-size-fits-all undertaking. Your business and industry will determine how effective it will, how long it will take to meaningfully impact your business, and how competitive the search results page (SERP) landscape is. For example, if you are a local dentist you’ll need to try to get into the map listings for your queries (e.g. [denver pediatric dentist]) but if you are an international travel marketplace you’ll be competing against a lot of big brands such as Hotwire, AirBNB, and the like. Because of this, you need someone who understands your space and what it will take to rank competitively. I wouldn’t recommend hiring someone who has done SEO for a direct competitor of yours, simply because long term you will be better off with someone with fresh ideas. If you hire the person that your competitor used, at best you’ll be playing copycat while they are moving on and working with the next SEO expert. Instead, I recommend thinking a level higher than your specific business type (let’s continue with the dentist theme). You should instead look for someone who has vast experience doing SEO for local businesses. If you own multiple dentist practices, then you should look for someone who has experience doing multi-location SEO for local businesses for law firms, auto dealers, and the like. Do a site: search for your domain in Google and note the number of pages they say are indexed. For example, for getcredo.com I would simply put site:getcredo.com and note that there are approximately 554 in Google’s index. Use this free page auditor to get an initial on-page SEO look at 25 of your site’s pages. SEMrush isn’t perfect – GetCredo.com gets way more than 405 organic visits a month. But it’s a jumping off point to a conversation with a professional SEO expert or agency. Because SEO is not one-size-fits-all, you should also find someone with deep experience working with your size of website. Doing SEO for an international marketplace with tens of millions of pages in Google’s index is very different from doing SEO for a local dentist. The strategies are different, the tactics are different, the results are different. You need someone who has worked with your size of website. PSA: If you want help defining your project, I offer that as a paid service through the Credo Porter service. A solo SEO consultant (sometimes called a freelancer) is someone who works on their own, often primarily on strategy and recommendations, to help companies increase their organic traffic. Most of the time, a solo consultant will not also be implementing the strategies they recommend or the fixes they find based on an audit. An agency is a compilation of many types of employees – strategists, account managers, writers, and more. Agencies will often have channel specialists (such as SEO or pay-per-click), teams to execute on some of the strategies (such as developers or designers), as well as some junior employees and account managers in larger agencies. The type that is right for you depends on the capabilities you have at your business, such as developers, or that you can hire. As you figure out all of the above, also keep an ear out for the following two terms: strategy and services. Sometimes the SEO world will use these two terms interchangeably or not do a great job of branding themselves as one or the other (SEOs are often not very strong at branding). But knowing the difference between the two and hiring the right one for your business is often the make-it-or-break-it part of the whole hiring process. If you do not have developers or designers internally and don’t have one you trust to hire, you’ll want to look for a full-service agency who offers these services as well as helping you with your overall strategy. If you need these and you hire an individual consultant, you may get a lot of great recommendations but you’ll quickly run up against challenges of implementing them and thus you will not see the forward movement your business needs. The same applies if you do have full teams internally to do work. Many large businesses I have personally worked with have, in the past, severely underestimated how important it is to have a consultant who has experience working across teams, communicating with developers, and making business cases to help get people assigned to the projects and the work done and set live onsite. When hiring for a specific channel like SEO, an individual consultant can be a fantastic choice for bigger businesses. Now that you’ve educated yourself in SEO (and maybe even tried to implement some of it yourself to learn the ropes), learned what type of SEO expert (or agency) you need to speak with, and understand what type of site you have, you’re ready to start speaking with potential providers. When you do this, you need to ask the right questions to quickly qualify in (or out) providers that are or are not the right fit for you. The biggest mistake I see businesses making when hiring a consultant or agency is overlooking the provider’s fit with your style of working. The consultant or agency can be the best in the world, but if their preferred way of working does not suit your business’s then you will experience turbulence and stress from the start. Whether they require a minimum contract. While a 3 or 6 month contract is legit and is often needed to really see results, longer than that can sometimes be nefarious. Their rates, how they bill, and how long after billing do they expect payment. You should expect to negotiate terms, or for them to negotiate back if you have Net-60 terms (meaning you don’t pay bills until 2 months after they are received). If you are not aligned on any of the above, the relationship will be strained and likely not successful longterm (or possibly even get off the ground at all). Every agency works differently and has a different structure than another. I’ve never, in my eight years of professional SEO/digital marketing experience and couple years working directly with agencies, seen two agencies that work exactly the same. This is simply because the agency/consulting business can be successful in many different ways and the positions that exist usually depend on the prior experience and relative strengths and passions of the founder or founders. As well, you need to know yourself and your own working style. If you work quickly and like to make decisions quickly, you will likely be frustrated if you are stuck communicating only with an account manager who likely does not know marketing that well and has to relay questions and answers between you and the person with the subject matter expertise who is actually doing the work. However, if you really trust the agency/consultant and after a while don’t need a lot of attention and your campaigns just run and make you money, you may appreciate having an account manager who checks in with you semi-frequently and makes sure you have the campaign result reports consistently every month. The simplest way to learn who you will be working with directly is to ask during the initial courting process with the agency. Asking how they communicate, how often they communicate, how quickly you can expect replies, and who you can go to as your primary point of contact will tell you a lot about their way of communicating with clients. Another question that I love to see businesses ask is “How many clients does each consultant have at a time?” This tells you if they are a client factory or doing high-touch consulting/strategy work. A general rule of thumb is this – the more clients each consultant/strategist works with, the more likely you are to be primarily communicating with an account manager instead of directly with the person doing your work. I’ve come across a lot of businesses who do not want to work with an agency, especially a large agency, because they think they’ll likely be given a junior person to work with instead of the senior and more skilled members of the team. Unfortunately, this is often true. Businesses go work with a specific agency because they saw the founder or a senior person speak at a conference or saw their content such as an article or an interview in a well-read industry publication. But the reality is that 9 times out of 10, that person who you saw who impressed you so much will not even touch your project (there are exceptions to be sure, but they are few and far between). So during the courting process once again, ask who will actually be doing the work on your project. Ask about their experience, their client successes and failures, what they are passionate about. If you are not comfortable with them, bring this up to the sales person (or more senior person if there is one involved in the sales process) and discuss it openly. This is often why a lot of businesses would prefer to work with a very seasoned solo consultant. This is challenging when you need a lot of different channels and services, but at least with a solo consultant you know who is doing the work (though you should ask if they sometimes use freelancers to get certain work done). If you’re not a marketer yourself, you probably don’t know what is reasonable in terms of expectations for how long it will take to see results from your agency or expert. Ask them to explain their methodology to you, how long it usually takes to get set up within their systems, the work that needs to be done before campaigns can go live, and how long that usually takes. You also need to work out the dependencies with them, such as content needing to be written or research that needs to be done before setting campaigns live or starting work together. The best agencies and consultants always try to under promise and over deliver. They want you to have realistic expectations as to what you can expect to see and when, and when you know that it is either working well or the strategies need to be rethought. I’ve seen too many potentially great client/agency relationships that get cut short or never have a chance to succeed because expectations were not set on both sides. So don’t let that happen to your project. By this point, you’re almost ready to sign. You’ve learned a bit about SEO yourself, you’ve thought through whether a solo expert consultant or agency might be right for you, you’ve asked a ton of questions, you’ve found out who you’ll be communicating and working with, and your expectations have been set. At this point, I always recommend that you now try to speak with a few of their current and past clients to get their perspective on your agency. If they don’t have any former clients that you can speak with, that’s a major red flag right there. I recommend reaching out to these references via email first, and trying to hop on the phone with them for even just fifteen minutes. It’s amazing how much better feedback you can get via voice than in an email, because you can ask followup questions and the feedback loop is that much faster. What is (agency/consultant) really good at, as in world class? What words of advice would you have for someone considering engaging with (agency/consultant) for a project? 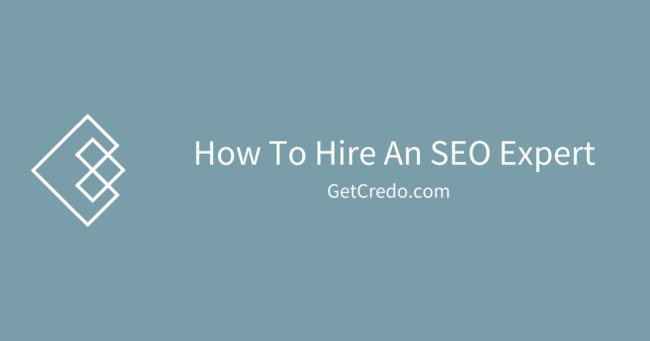 Hiring an SEO expert or agency is not an easy task. I’ve seen so many try and fail to hire the right one, but also seen when the proper research is done and the relationship is smooth and successful on both sides. We’re here to help you hire well. If you’re ready to hire, then you can contact us to help you out (free). If you’re not ready yet, then sign up to our content updates (at the top of this and every post). By the way, if you are a consultant yourself and need more clients, check out my article on How To Get More Consulting Clients and also see about signing up to Credo. Awesome points how to hire an SEO expert, especially liked the that need to learn SEO yourself too. Thanks again and keep posting in future too.